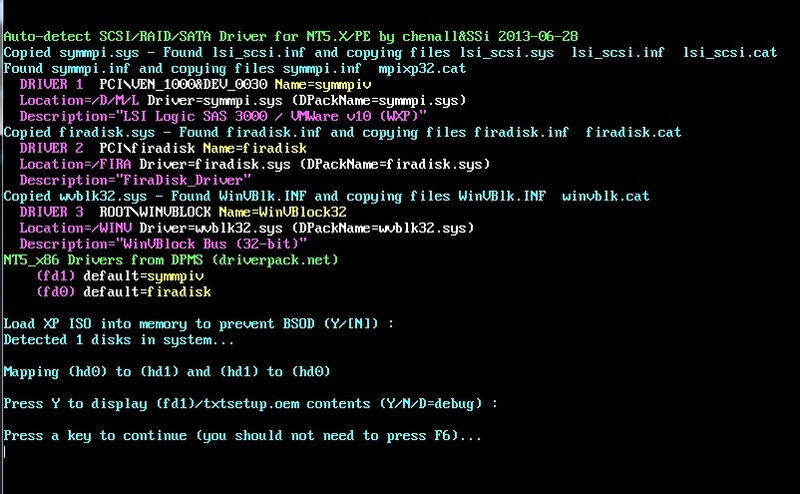 RMPrepUSB, Easy2Boot and USB booting: DPMS 2 coming soon! I have heavily modified chenalls DPMS script during the last week and have been testing it on both virtual and real hardware. In VBOX I have tested in IDE, SATA(AHCI ICH8) and SCSI systems. These all install XP correctly in text-mode and GUI Mode. I also tested on a real ICH8 notebook in IDE and SATA mode with success. I have had to test using Firadisk and WinVBlock drivers so this doubled the testing. I have also added code to copy the PnpInstances section over to the txtsetup.oem file, so it should work with most SCSI systems. I have got to the stage now where it all works but the code is not pretty! I should be able to make the early package for E2B available for anyone who has made donations soon. I will then be making some YouTube videos demonstrating E2B and the DPMS auto-detection feature and after a month or so I will release the DPMS Update package for everyone. It has been a hard week and there have been lots of frustrations (twice I 'broke' the code without realising it until later and then spent a day on each problem trying to find out what had gone wrong!) - really frustrating! David B's VM Starter app has certainly helped as I can boot from my USB on VBox and have full read/write access to the USB stick. The new DPMS 2 batch file also copies the F6 floppy txtsetup.oem's and directory listings to some log files on the USB stick. This will help in the event of any problems found by users as they can just send me these 'log' files. Here is the DPMS output on a VBOX SCSI system.